As with all the other titles in this series by Bonny Becker and Kady MacDonald Denton, 'A Library Book for Bear' is utterly delightful. Bear and Mouse are unlikely friends. Bear likes his solitude, he is set in his ways, he likes quiet and routine and is perhaps a little gruff on the surface. Mouse on the other hand is friendly, bright and energetic and he brings new adventures to Bear's doorstep - whether Bear likes it or not. 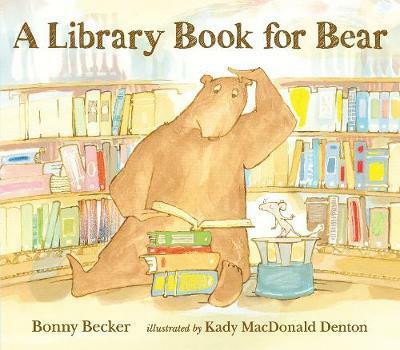 On this particular occasion, Mouse takes Bear to the library, although Bear really doesn't need to go to the library, because he has all the books he could ever need right on his shelf at home. But Bear promised Mouse, so off they go to the Library (on roller skates no less!). However, once at the library, Bear can't quite get his head around the extravagance of so many books, the ridiculousness of some of the titles and he insists (and quite loudly) that a good book about pickles is all that he requires. As he voices his frustrations in ever increasing volumes, he draws the attention of the Librarian who is reading a book at story time. The Librarian invites the irate Bear to join them for a story and from that moment, Bear is captivated. He discovers not only the wonders that the library has to offer him, but also that there are fascinating books on topics other than pickles. In fact he takes no less than seven new books home from the library. This story has a beautiful flow, complimented by the illustrations in a gorgeous soft autumn palette. This combined with the increasingly large, bold text to convey Bear's increase in volume makes for a vibrant and engaging read aloud story. This book is a celebration of reading, of sharing books together, and of the library. But it is also a story that encourages trying new things, stepping out of your comfort zone, and listening to your persistent and very caring friends. As I said, utterly delightful!